Do you still #TBT? Many of us have a short-term memory when it comes to policy, social media too perhaps, cause I haven’t seen a #ThrowBackThursday post since Facebook started showing you your past posts. The National Coalition for the Homeless recognizes that we are at a pivotal moment in our social policy. Modern mass homelessness, as we know it, began, not that long ago, in the 1970’s. But here we are, again facing threats to social programs that are vital for the survival of working families, and now in the midst of unprecedented economic inequality. In solidarity with the National Low Income Housing Coalition’s Our Homes Our Voices Week of Action (May 1-9) and the Poor People’s Campaign: A National Call for a Moral Revival 40 Days of Action (May 14-June 23), we are going to be posting historical information that relates to current trends, policy proposals, and cultural perceptions of those who experience poverty and homelessness. To kick us off, we’ve included some more detailed history about how and why our organization was formed, and what we have accomplished over the years. When modern homelessness first emerged in the late 1970s, hundreds of thousands of homeless were forced to fend for themselves on the streets, and many died or suffered terrible injuries. In 1979 a lawyer named Robert Hayes, who co-founded the Coalition for the Homeless in New York City, brought a class action lawsuit in New York State Supreme Court against the City and State called Callahan v. Carey, arguing that a constitutional right to shelter existed in New York. In particular, the lawsuit pointed to Article XVII of the New York State Constitution, which declares that “the aid, care and support of the needy are public concerns and shall be provided by the state and by such of its subdivisions…” The Coalition brought the lawsuit on behalf of all homeless men in New York City. The lead plaintiff in the lawsuit, Robert Callahan, was a homeless man suffering from chronic alcoholism whom Hayes had discovered sleeping on the streets in the Bowery section of Manhattan. In August 1981 Callahan v. Carey was settled as a consent decree. By entering into the decree, the City and State agreed to provide shelter and board to all homeless men who met the need standard for welfare or who were homeless “by reason of physical, mental, or social dysfunction.” Thus the decree established a right to shelter for all homeless men in New York City, and also detailed the minimum standards which the City and State must maintain in shelters, including basic health and safety standards. In addition, Coalition for the Homeless was appointed monitor of shelters for homeless adults. On the heels of the landmark Callahan win, the decision was made to take the work of the Coalition for the Homeless national. Robert Hayes organized a meeting of several local coalitions in San Francisco in April 1982, out of which the National Coalition for the Homeless was established. 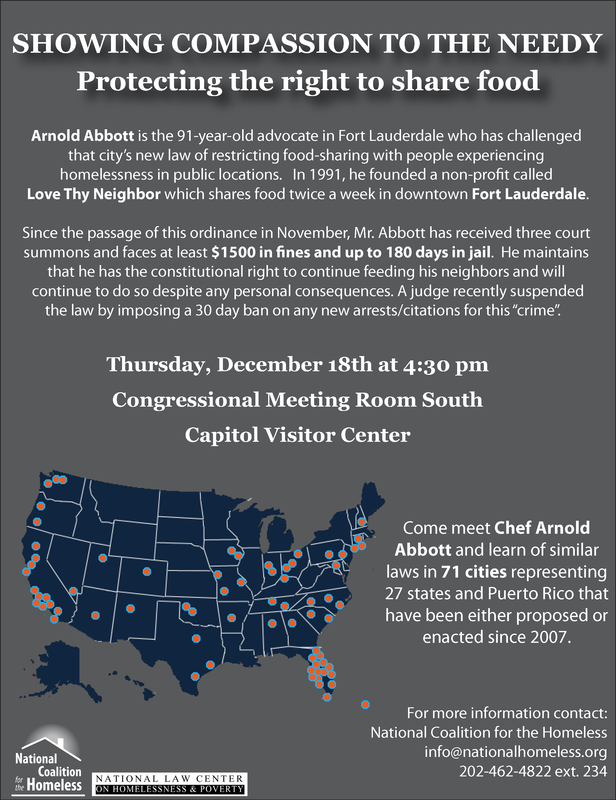 Sign Mr. Abbott’s petition to repeal these food-sharing restrictions in Fort Lauderdale!